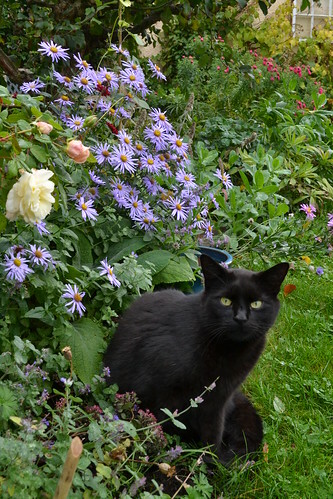 Halloween black cat in my autumn border, a photo by stopwatchgardener on Flickr. I don’t even particularly like our cat, Slinky, what with his periodic bird killing, but I admit he does look cute and rather Halloween-appropriate in this shot I was trying to set up of the autumn border. He slipped right into the composition and I made the sound of a dying bird to get him to look at me. The rose to the left of the cat is the David Austin Crocus Rose, which to my nose has the scent of lily of the valley. It does suffer from some black spot at this stage of the year, but I love that its creamy huge flowers appear twice in the year, including now when they are most needed in mid-October.